1Start by filling a large pot with water to boil the spaghetti. You'll probably need about 8 cups of water. Bring the pot of water to a boil. 2Meanwhile, in a medium sized skillet heat oil over medium heat, add the onions and cook until they become soft, 3 to 4 minutes. 3Then add the shrimp, garlic, oregano, salt, and pepper to the skillet (with the onions) and cook the shrimp for 2 minutes on each side. 4Be careful of splatter, add the vermouth and tomatoes to the skillet and stir into the shrimp and onions. Bring the sauce to a simmer. 5Add the cream to the tomato sauce, mix well, and simmer for another 2 minutes to ensure the cream and sauce is thoroughly heated. Stir in the lemon juice and basil. Cover the skillet and turn off the heat. Leave the skillet covered until the pasta is ready. 6Your large pot of water should be boiling by now, so add a tablespoon of salt and the spaghetti. Boil the pasta for 6 minutes and then strain. 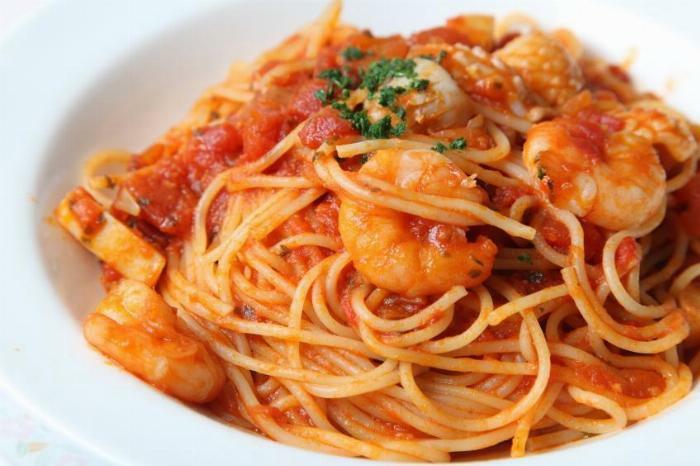 7Add your spaghetti to a large serving bowl and pour the tomato shrimp sauce over top, and serve.